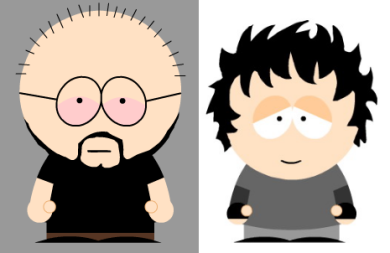 I know this link is ANCIENT but it's such a great thing that I think everyone should know about it and use it: Here is "South Park Construction Set" where you can create your own SouthPark-style characters, preferably resembling you. Unfortunately, it doesn't offer any simple "export" method but "screen capture" is your friend. This is me and Karolina (Karolina is slightly reduced in size using The Gimp because otherwise she'd be taller than me). Specifically, that's how "she sees herself". It seems like you have visited my blog :-] Nice! jr: Back off, blogger! Nobody likes you and nobody reads your crappy blog. Yeah! This is an anti-blog blog!